Look closely at just about any Major League Baseball game, and you'll see them on almost every player -- necklaces made with titanium, magnets or other things in the team's colors worn around their necks. Professional athletes wearing necklaces, during a game? A bulky fashion statement? Not exactly, They're filled with titanium or other materials that athletes think will improve their performance. Science isn't on their side. Athletes are notoriously superstitious, and, as the World Series starts, a national audience might wonder whether -- as some of the players believe -- these mysterious necklaces played some role in their getting to this stage. "It doesn't make sense. If you look at a wristband with a simple hologram on it, how could that work?" 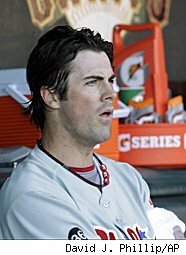 said Jim Ruschman, president of EFX Performance, Inc., which sells $25 wristbands and $30 necklaces and has Philadelphia Phillies pitcher Cole Hamels (pictured) wearing its products on the mound. Ruschman said he was skeptical when he first heard of embedding frequencies from the electromagnetic spectrum into a hologram, but has found that it affects what he called the bio-electrical field around the body and improves balance, flexibility, endurance and strength. The makers of these products, including EFX, say they don't make medical claims and so FDA approval isn't needed. Medical professionals and scientists in the years since the necklaces first made their way onto the U.S. sports scene have expressed either great skepticism or outright scoffed at the claims of magical benefits from wearing metal or tiny magnets. Phiten, a Japanese company founded by a chiropractor in the 1980s, started the craze after developing a way to dissolve nanoparticles of titanium in water and then infuse it into products including shirts, socks, stickers, athletic tape, necklaces and massage lotion, according to aWall StreetJournal story. In such forms, the titanium works "with your body's energy system, helping regulate and balance the flow of energy," Phiten claims, according to the Journal. "Proper energy balance helps to alleviate discomfort, speed recovery and counteract fatigue. Athletes find that they tire less easily and recover faster from intense physical activity." Boston Bruins player Shawn Thornton, 33, wears a Trion Z necklace with magnets in it, and while he doesn't know if it's scientifically valid, he said he believes it lessens his injuries, which makes him less irritable. "A lot of the nagging injuries, the little ones, don't feel as nagging anymore," Thornton told WalletPop in a phone interview. "It gets ripped off when I fight sometimes, but it's not a big deal." Thornton tied for fifth in the NHL for most fights last season. Even if the necklaces and bracelets do absolutely nothing -- the most likely scenario -- believing they do (thanks to marketing and superstition) can actually allow a user to trick themselves into gaining some psychological edge. That can be a big deal to a pro athlete. Craig Friedman, director of performance innovation for Athlete's Performance, which trains many MLB players, told WalletPop in an e-mail that many baseball players who train there wear titanium bracelets or necklaces without knowing if the science is valid. "Currently, the research on these bracelets and the results they promise is inconclusive," Friedman wrote. "However, many of our athletes have noticed changes and feel more balanced when wearing them during practice, preparations, and games." When incoming athletes ask him if they should wear them, he tells them there is no harm. Whether they cause a biomedical or psychological change, "any ethical edge an athlete can gain in terms of confidence and how they feel going into a game is a helpful one," he said. Author Joe Bruno says he wears a titanium necklace while working out at the gym, along with an iRenew bracelet (a product Consumer Ally has noted several times is considered nothing but a marketing ploy), and says the lack of science won't dissuade him. "I feel better at the gym and I sleep better at night," Bruno wrote in an e-mail to WalletPop. "Is this proven by science? Who knows? But I won't stop wearing them."